Twelve young Air Niugini engineers have returned home last week with their Aircraft Maintenance Engineer(AME) certificates after successfully completing their four year engineering cadet program at Air New Zealand Training institute, based in Christchurch, New Zealand. The program was fully funded by Air Niugini at the cost of K5.3million. It aims at developing young Papua New Guineans to be fully Licensed Aircraft Maintenance Engineers(LAMEs) with secure careers, working for Air Niugini. Air Niugini Chief Executive Officer, Mr Simon Foo in congratulating the graduates emphasized that Air Niugini was committed to training, skilling and development of human resources by investing millions of kina towards employee training every year. “The cost of training each engineering cadet exceeded K440,000 and Air Niugini is proud of its wide ranging commitment to professional and trade training for its national employees,” Mr Foo said. Upon gaining their EASA Basic Aircraft Maintenance License, they will be eligible to apply for their PNG Civil Aviation Safety Authority (CASA) Aircraft Maintenance Engineer (AME) License by passing the PNG Civil Aviation Airworthiness Legislation Examination. The 12 Aircraft Maintenance Engineers(AMEs) are now preparing for this exam through reviews and coaching conducted by the Air Niugini Training School. Mr Foo also said the achievement by the 12 young men is a bonus for Air Niugini as the airline is now in the process of building its own Maintenance, Repair and Overhaul facility here in Port Moresby. “Having our own hangar will allow the employees to continue their training on the full license here in Papua New Guinea, it also means the aircraft maintenance can be carried out here, cutting down foreign currency costs and building our in-country experience and capacity”, Mr Foo said. 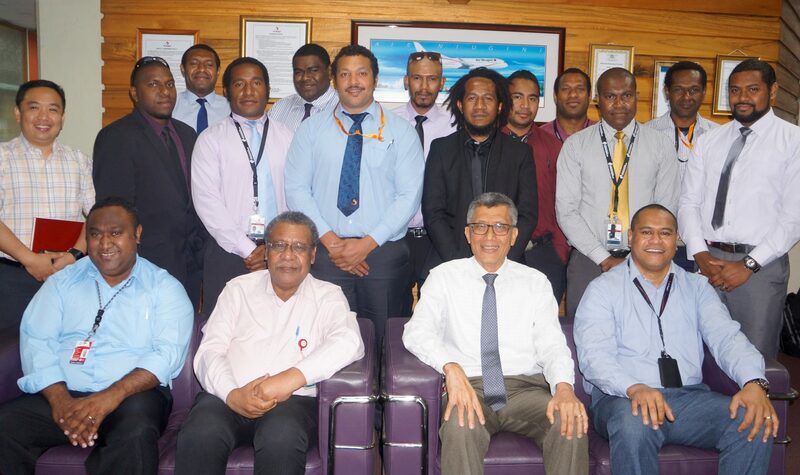 Air Niugini currently has 38 cadet engineers including six females whilst 46 Aircraft Maintenance Engineers (AMEs) and 60 Licensed Aircraft Maintenance Engineers. (LAMEs).